If you have to bake something, but would rather get lost on facebook, watch Netflix, or take a nap, this simple Blackberry bread might be just the thing. Ok, so most people don’t have to bake. If they do, they’re probably pastry chefs or professional bakers who would laugh at the idea of making a simple blackberry bread. But maybe you promised to bring something to a brunch, or have a bunch of hungry teenagers and two loaves of baked goods should always be around. Or maybe you need to do something with a bucket of blackberries you went through the trouble of picking. Whatever the reason, this bread will get you out of the kitchen in no time, and back on the couch where you belong. I loved baking when I was a teenager growing up in Germany. I would get cookbooks from the library, peruse them in the evenings when the family hung out watching TV, and hand copy recipes I liked into notebooks. My mom still has some of these notebooks. She doesn’t seem to have the heart to throw them out, even though she wasn’t enthused about the excessive hours I spent on unnecessary kitchen and food activities like baking and cookbooks. At first she was glad that my sister and I showed an interest in making things for family “kaffeeklatsch” get-togethers. But it soon became apparent that we seemed to be wasting any emerging pastry chef talent on crazy creations guests only tasted out of politeness. When everyone would’ve just preferred a regular German apple or cheesecake (the latter made with “quark,” not cream cheese), we would experiment with coca cola cake from a Betty Crocker cookbook, Milky Way bars, or chocolate cheesecake made the American way. (Clearly, we didn’t do a good job selling American cuisine to the older German generation). More often than not, we carted these concoctions off to our own parties and get-togethers. Unlike unappreciative family with limited local tastes, our friends’ teenage appetites were willing to devour whatever we set in front of them. My baking obsession came to an eventual halt, to be revived only sporadically for Christmas, potlucks, or for students at semester’s end (usually for the day they had to fill out evaluation forms:)). Otherwise, there just wasn’t enough of a reason to bake, and not enough people to bake for. Who would eat all that stuff? Well, now that we have an inn, and therefore guests who eat stuff, I’m back in the baking habit. And I still like to try new recipes, only I have to be a bit more careful than I was in high school. 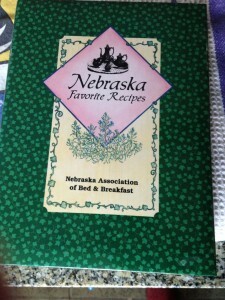 I don’t think coca cola cake would go over well during a Towne Motel breakfast – although you’d be surprised at the kinds of things people eat on vacation that they never would otherwise. (Stay tuned for a post on peanut butter chocolate chip and similar heavy duty pound cakes). Unlike (I assume) most other innkeepers, I rarely decide until the day before or the day itself what I want to make – it all depends on so many factors. I just thought I’d mention that in case the next paragraphs make you wonder how I could be so unorganized about a daily task. Maybe I just go along with the unpredictable nature of inn-keeping, or maybe I’m indecisive; whatever it is, it just doesn’t seem fun to have a baking schedule laid out for the whole week. Especially because a schedule can’t predict the most exhausting days of the week – the days when you’d rather put up your feet than stand on them to bake. In July and August, we have lots of such crazy busy days – days when we’re simply unable to try a new recipe or adapt an old one in newly creative ways. Anything that involves yeast – out of the question. A recipe that calls for four cups of apples to peel and dice? No dice. Not even recipes with simple fillings or toppings or streusel look tempting on such days. (Well, except for Apricot bars, but that’s just a layer of jam). Instead, just like any other innkeeper we know, we seek refuge in our tried and true, foolproof, one-bowl recipes, some of which are gifts from Jane, previous Towne Motel breakfast chef ( who clearly knew what she was doing when it came to crazy summer days). Siobhan is usually the first to recognize a day’s limitations, maybe because her day starts and ends earlier than mine. Or maybe because she’s more realistic when it comes to time: while I might start panicking at 11 am that there won’t be enough hours in the day, or else see a day still leisurely stretching out ahead of me at 2 pm, Siobhan usually has a firm handle on the situation no later than early afternoon. “Well, this will have to be an Apricot Bars day,” she might declare shortly after lunch, having just slashed her previous, more elaborate plan, the kind that might have involved shopping, refrigeration, layers and a glaze. At that time of day I am either in denial (do I have to bake today?? Well, I’ll think about that later), or still full of ambition and optimism: after my ocean swim, I tell myself, I will have a load of energy and can pretty much bake anything I put my mind to. No, it can’t always be granola. For one thing, that seems like cheating, considering how fast and easy it is to make. But also, sometimes granola doesn’t work well with what Siobhan is making, or what we’ve made the day before (we try not to serve two selections with nuts on the same day, for example, or with oatmeal). I ask Siobhan for advice. True, people like it, but this past summer I’ve started adjusting the recipe to one and a half times the ingredients because the loaves are not high enough when I don’t, and then the measurements are a tad more complicated (I did say this is the lazy way I think on exhausted days). Still, she’s right. 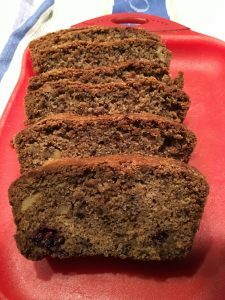 Blackberry bread is a good option for days that call for speed and simplicity: understaffed housekeeping days, 20-bag shopping days, fifteen-check-ins days, or days when an A/C breaks down after the housekeepers left and the only spare we have is too heavy to handle. (Not to mention days with the kinds of unpredictable events all innkeepers could write books about, if they had time). I’m not saying that the shorter the recipe, the less time consuming it is to make (I’ve learned my lesson in that regard). But in this case, there is a correlation. Also important: we always have all the ingredients at hand, unlike, say, for cranberry orange bread, which usually requires a special orange buying errand in the summer. Or for strawberry rhubarb bread: we almost never have rhubarb. Could we change that? Yeah, probably… If we find space to grow our own rhubarb. Or buy a lot in May and freeze it. Or investigate the frozen rhubarb situation…. So, if we want to make rhubarb breads and muffins all year, we better buy a lot of rhubarb in May and freeze it. 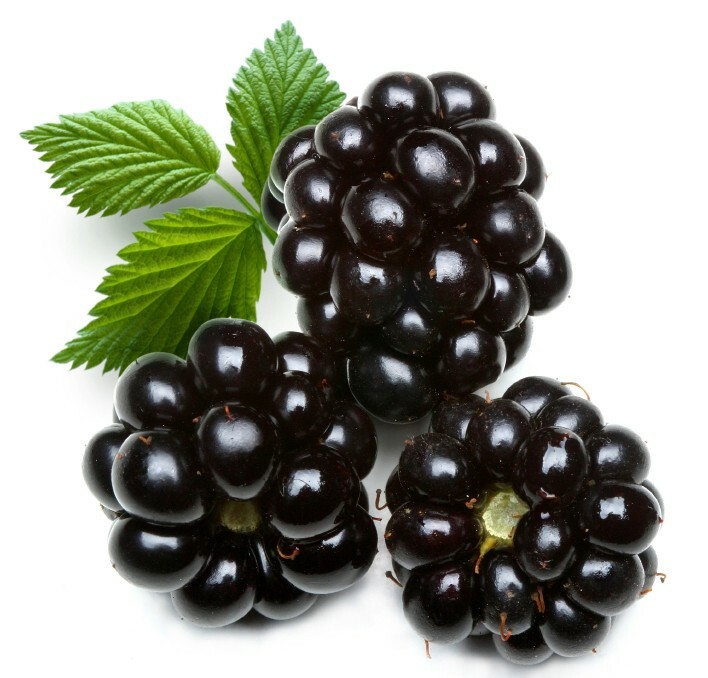 But back to blackberries. These guys are pricey when fresh, but – at least from the supplier we use – are more affordable frozen than raspberries are. Or even blueberries – go figure. Maybe it’s about size – the smaller the fruit, the more expensive? At any rate, we always have a large bag or two of frozen blackberries around, which makes blackberry bread a year round option. Also, this recipe is oil- rather than butter – based, and that’s always a minute or two faster for anyone who buys butter wholesale (Our butter comes in 1 lb packs rather than pre-apportioned sticks). You don’t have to beat the eggs any more than just briefly by hand before mixing them in with everything else, and nothing has to be whipped to the point of fluffiness and puffiness. There’s no need to sift the dry ingredients, or to use a stand mixer – in fact, it’s better not to, since you just mix everything until combined. The one slightly more time intensive task is to halve the frozen blackberries, which I do because ours are large – but that’s optional and would be even easier to do with fresh blackberries. If you buy your walnuts in halves rather than chopped, you’ll have to do some additional chopping. But as with the berries, walnuts are pretty low maintenance when it comes to their readiness to go under the knife. If you don’t have walnuts, you could use pecans instead. Or chocolate chips, if you don’t mind the extra sweetness. Or simply, nothing! 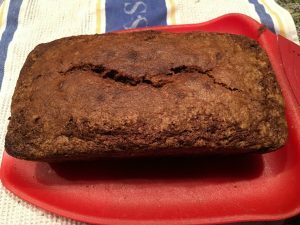 Ok, so blackberry bread is quick for us to make, but what’s in it for the guests who eat it? It remains moist for several days, although that’s not all that unusual for oil based loaf breads. Siobhan’s lemon bread and my pumpkin bread are long term moisture retainers too, and could probably be served two days after coming out of the oven, without anyone complaining. But there is something special about the taste of this bread, which seems to come entirely from the spices, maybe in conjunction with the blackberries. Best of all, these are all common spices, which – unless you’re a baking virgin – you probably have around. If not, they’re super easy to find, even if you live in the middle of nowhere and don’t have time to wait for an Amazon delivery. Your convenience store on the corner might carry them too! 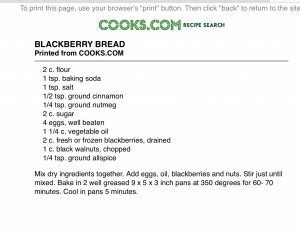 Now, the fact that this blackberry bread is a simple loaf pan recipe also comes with one drawback: its complete lack of pomp and circumstance. If you want to sell out first in a bake sale, or win a kids’ popularity contest, go for something else. 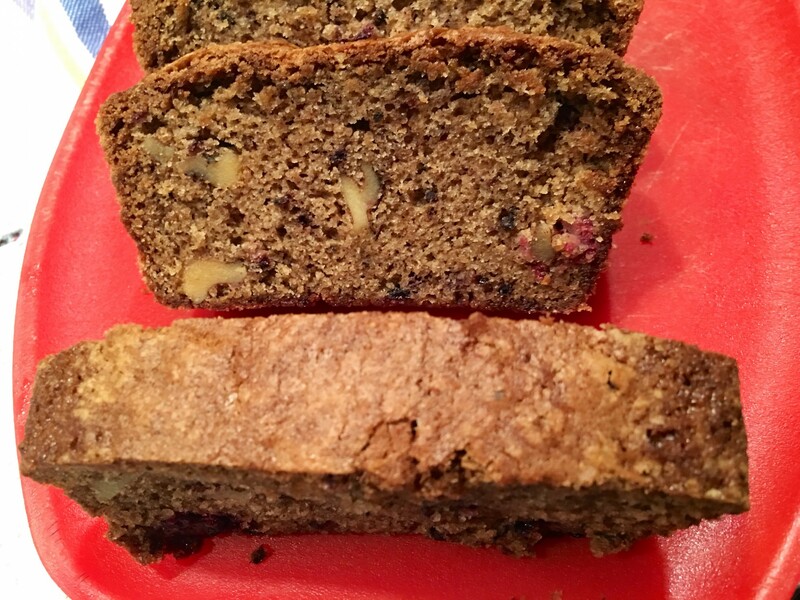 Blackberry bread is an unassuming, modest little thing – one might even call it a bit homely. It’s smallish and darkish, no splashy contrasts like white frosting on chocolate cake, or lavish fruit and whipped cream decorations, or even just a bright standout color like lemon bread. You could put a glaze on it of course, or at least dust it with powdered sugar (or maybe a glaze and sprinkles on top of it?) – but even so, it won’t steal the show like a tray of frosted cup cakes, summery fruit tarts, or a perfectly shaped bundt cake centerpiece with glistening chocolate glaze. With blackberry bread, you’ll have to rely on its skill of quiet persuasion. It helps to serve it on as beautiful a plate as possible, perhaps with some fresh blackberries dotting the rim. Especially if you use that powdered sugar I mentioned, and let the blackberries sit on a bed of fake snow. The rest is up to the bread itself – just let it do its job and see what happens! We’ve served the “cake that won’t last” many times, but we’ve never actually called it by its name on the breakfast board. We don’t want to brag, nor be secretive about its ingredients: after all, if people don’t know what they’re eating, they might not eat it, which in turn means it’ll be a cake that will last. We want this cake to remain a Towne Motel favorite and live up to its name – even if that name remains a secret (for anyone other than readers of this blog). Don’t try to find this on Amazon! So we usually call it banana pineapple walnut bread, or pineapple banana cake with walnuts, which is pretty much what the major flavors are. Besides sugar, of course. But sugar isn’t really a flavor, is it? And baked goods aren’t always named after their main ingredients; otherwise most would have names like, “sugar egg cake with butter and flour,” or “buttery pound cake with beaten eggs,” or maybe just BSFE cake. I guess the word “cake” or “cookies” implies these standard ingredients, just like the word “candy” implies sugar. Which raises the question, how did sugar cookies get their name? Do they have more sugar than other cookies? Is sugar the only flavor they have? It would be hard to find such cut-to- the-chase recipes on popular food and baking blogs, but if you have any old cookbooks or handwritten recipes inherited from previous generations, you will know what I mean. (Online, I’ve primarily found them on cooks.com, a good no-frills recipe site) Short, to the point recipes were probably all written by housewives for housewives, most of whom could think of more exciting things to talk about than cake and casserole recipes. Women who expected their audience to know how and in which order to handle ingredients. And women who would never idealize or even fetishize baking and cooking, because it wasn’t their passion – it was their job. My mom sends me yeast bread recipes in the minimalist category: a list of ingredients, followed by the direction, “make a yeast dough.” Nothing about the rise times and order of ingredients. Sometimes the amounts are ballpark figures (3 1/2 – 4 cups of flour), or simply a bit vague: “lemon,” it would say, or “salt” or “vanilla.” I’m expected to know the specifics, since, after all, she’s been telling me these things ever since she taught me about baking. If you make something often enough, my mom says, you make it according to “Gefuehl und Wellenschlag,”– a German expression that doesn’t make much sense once you think about it or try to translate it: “feeling and wave pounding.” Basically, it means you play it by ear and go by instinct and experience. No idea how this expression came about. 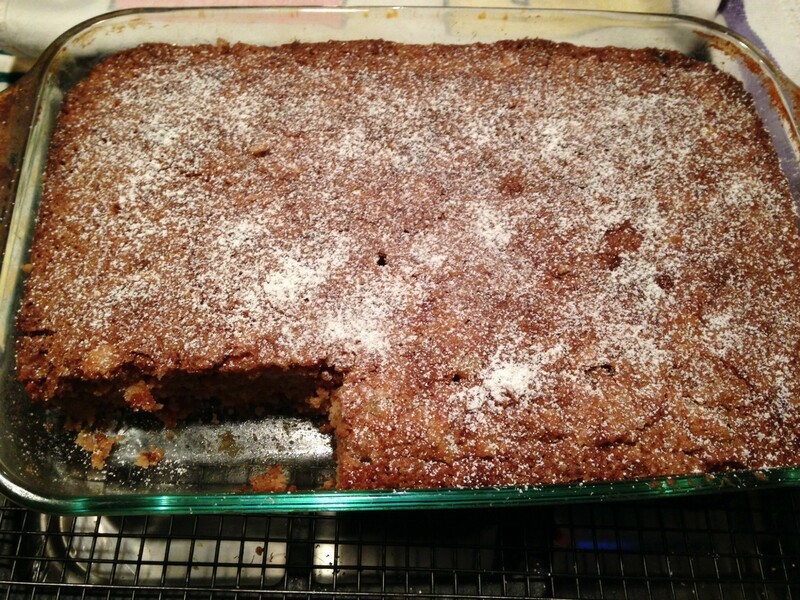 The recipe for our banana pineapple walnut “cake that won’t last” is a bit more detailed than other minimalist recipes, but not very helpfully so. You start by beating 3 eggs, and then mixing in – in this order, supposedly – 3 cups flour, 3 cups sugar, 1 tsp. salt, 1 tsp. baking soda, 1 tsp. cinnamon, 1 ½ tsp. vanilla – followed by 1 cup oil (not clear what kind), 2 cups diced banana, one 8 oz can pineapple (I assume crushed, but that’s not clear, nor is it clear whether it should be drained or not. I drain it), and ½ cup chopped black walnuts (regular walnuts are fine). If you’ve ever tried to add 6 cups of dry stuff to 3 beaten eggs, you probably know that at best, you’ll end up with dry, sandy streusel. So I begin to mix in the wet stuff earlier, which is still a bit of a struggle because you’re supposed to do it by hand. I remind myself that I’ve made this before and it always works out, so I just keep going until it all becomes one wet, unified mess. So, if you like the feeling of seeing something work out that seemed at first impossible, this is the cake for you! It actually feels less and less impossible the more often you make it. And you’ll probably make it often – unless you’re not a baker, of course. The final product, minus two pieces stolen by Siobhan before I could take the picture! There is something pretty great about one-paragraph recipes. Sure, they can be confusing for anyone who doesn’t know what they’re doing: no step by step photo instructions or fool proof explanations. No stooping down to “visual learners”: there are usually no photos at all, much less photo tutorials of how to beat egg whites or pour sugar into a bowl. But I like the fact that minimalist recipes aren’t self-absorbed and self-indulgent. Unlike most baking blog recipes, they don’t try to promote a whole website and persona along with the recipe. They don’t tell you about the author’s dog and husband and pre-blog career, much less her new kitchen gadgets or the stages of her pregnancy. They don’t come with an entourage of pop-up ads or corporate endorsements (unless they’re in a Kraft or Pillsbury cookbook, of course), and they don’t shower you with ten shiny photos of the final product barely distinguishable from each other. The little you see is what you get: a list of ingredients, and basic instructions. That said, chatty recipe blog posts have some personality and can be more fun to read, as long as they aren’t cluttered by newsletter invites and reminders from the last websites you shopped on (and they almost always are). Their authors are almost all female, usually in their thirties, and their blog personas tend to be enthusiastic, humorous, and full of creative and business energy. Many of them celebrate baking, writing, family, and the blogger’s pets, house, kitchen, garden, and local markets. Most of all, they make public what used to be mostly private and domestic: the collective traditional housewife experience, when women shared handwritten recipes, cooked and baked, and fed the results to neighbors, friends and family. These used to be everyday activities in most women’s lives; but they weren’t publicly discussed or valued, and most certainly didn’t get paid or written about. Some baking bloggers are new mothers or mothers to be, having quit their jobs at least temporarily to be with the kid(s). Blogging allows them to turn their creative passions and new home lives into something more public and fulfilling. Successful baking blogs often create a fantasy of a busy and productive, yet largely stress-free, fulfilling home life celebrating women’s traditional creative work and community. But a successful baking blog is only partly about nostalgia; it’s almost an ideal marriage of past and present, and that might be its main appeal for female readers. Food bloggers spend a lot of time in the kitchen, and much of their daily lives resemble that of a traditional stay at home mom. But they’re not ignored, alone, and working for free, and they take on a host of other identities as well: entrepreneur, writer, chef, photographer, teacher, webmaster – perhaps even a minor Internet sensation or soon to be cookbook author. They might see themselves as food artists, designers, and architects, multi media style – creating food, documenting their creations in words and images, photographing, facebooking, instagramming, and pinning them. Food blogging also involves storytelling; at least two different kinds, with the recipe at the center of both. There is written storytelling: stories and anecdotes about the recipe’s origin, what it means to its author, why it got to be on her blog, how she tweaked it to make it even better, and how it has performed at parties and holiday meals. There is also visual storytelling – the photo story of the recipe instructions, starting with a mouthwatering shot of the final product in its glory, and followed by step by step visuals how to get there. (A bit like a movie that starts with the ending, and then goes back to the beginning with something like “Ten years earlier”). The suspense, such as there is, is about the how rather than the what. The story pretty much follows the traditional linear narrative structure: exposition, rising action, climax, falling action, and conclusion. In drama and fiction, the exposition introduces at least parts of the setting and characters; in recipe photo stories, the setting is always a kitchen; and the “characters” are primarily the ingredients, secondarily the tools – often introduced together, as if in a group portrait. Next is the rising action, when the “characters” are beginning to do things or having things happen to them. In the case of a pound cake, let’s say, the butter is usually the first to come on stage: relaxing and softening in the microwave, it gets ready to gyrate with the sugar in a stand mixer (almost always Kitchenaid). Then the eggs come (or are forced?) out of their shells and start mingling, one by one, with the spiraling mass on the (Kitchenaid) dance floor. Meanwhile, in another part of the kitchen, the flour and other dry ingredients get ready together before joining the rest of the party. Once everyone (including any late arrivals, such as sour cream, fruit, nuts, chocolate chips, etc) has thoroughly mingled into a batter, we get to admire its shape in a baking pan, waiting to go into the oven. A modicum of suspense might kick in at this point – at least for anyone who forgot what the final product looks like – to be followed by the climax(es): photos of the finished product. From any angle, fresh out of the oven, released from the baking pan, glazed, iced or dusted with powdered sugar, maybe even served to someone, with tea or coffee, flowers and napkins. Some photo stories end with a half eaten piece of cake, which could qualify as the “falling action,” (almost literally so), and /or some wrap up comments by the author – the resolution or conclusion. As you can tell, these photo stories don’t have a very exciting plot. Characters don’t overcome obstacles or go through conflicts or set off on journeys to end up somewhere you never predicted. Not that baking can’t be adventurous: ingredients and tools can act unpredictably, bakers can fall asleep while their cakes are burning and shriveling in the oven (I’m speaking from experience); baking pans can refuse to release their contents, and dogs can demolish any masterpiece in a matter of seconds. 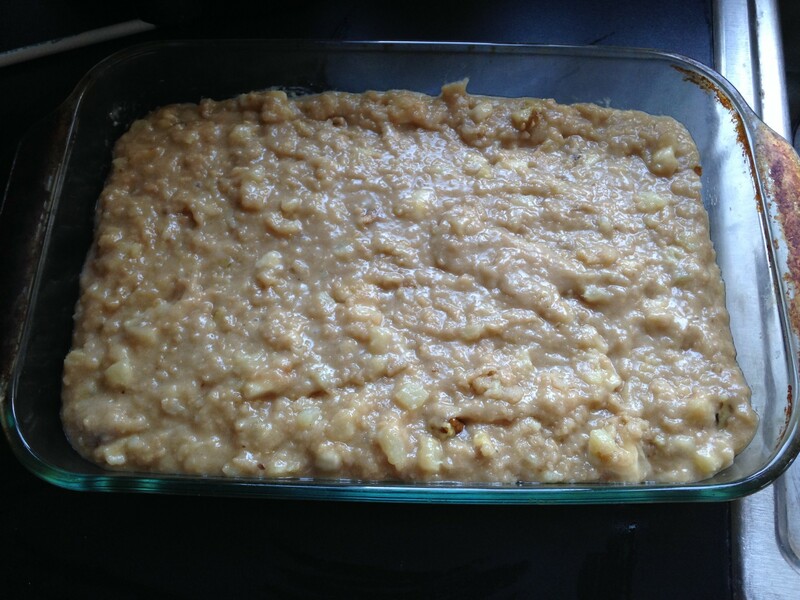 Baking blog stories are different: you know that everything will turn out well. There may be some challenges along the way, like tricky timing or decorating, but in the end, ingredients are happily united, baked to perfection, and memorialized by a series of perfect photographs. Make the cake! It’s easy, it’s good, and you can call it whatever the heck you want. You won’t even get graded – except by the people you feed it to, and they will probably give you an A :). 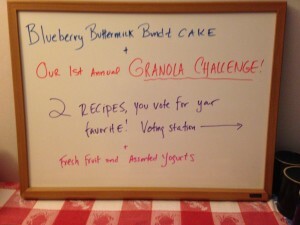 This blog post is dedicated to our friends Bill and MaryAnne, wonderful many-time repeat guests and big TM granola fans. They will soon be moving into their new Camden home and just recently stayed their last night with us! 1. I’m in charge of running breakfast, and the dining parlor gets all quiet and happy on granola days. You know that sound and feeling, when you cook or bake something and it turns out really well, and your guests all go quiet because they’re enjoying it so much? 2. It’s by far our most-requested recipe, and one I’ve promised several guests to feature in a blog post. 3. Many guests have said it’s the best granola they’ve ever had. 4. They ask where they can buy it. And are amazed that we make our own! We briefly considered selling gift-sized bags of our granola at the front desk….and then we envisioned the reality: us making batch after batch, the ovens running on hot summer afternoons (even more than they already are), the doorbell and phone ringing all the while. Like Lucy and Ethel on the chocolate-factory assembly line. We abandoned that idea. TM granola will remain an on-site pleasure. Katja is the granola chef and I used to worry that the granola was too much work. But she’s now got it down to a science: 12 minutes to put it together! It’s true. If you have all the ingredients and make it a few times, you can start knocking out batches at home. Everyone will love you. I’m going to hand this off to Katja now so you can get the recipe from her. – I can make it in less than 12 minutes! Especially if all the ingredients are where they should be, instead of hiding or lost somewhere else in the kitchen. But I think it’s become less of a science and more of a laissez-faire operation, meaning I’m not quite as picky about the exact measurements anymore. 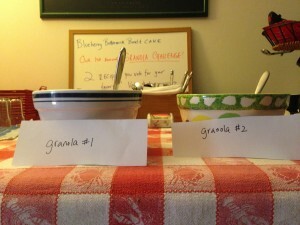 – I made two other granolas during the last month – the first one a popular internet recipe called “Megan’s granola”, and the other a healthier NYT granola recipe, because it was the day two guests arrived who specifically requested a healthy breakfast. They did not let us in on their definition of “healthy” (protein-rich? Low fat? Vegan? Low calorie? Low sugar? ), and they turned out to be pretty low key about it, but I thought it best to be prepared. So, this time I searched for “healthy” and “best healthy” rather than just “best” granola recipes, with oat bran and/or wheat germ, neither of which is part of our Towne Motel granola. Pour over and mix into dry ingredients, making sure everything is coated equally. Spread onto two baking sheets (no need to use parchment paper or cooking spray, though it’s probably fine if you do), and bake in a pre-heated 250 degree oven for about an hour and 15 minutes, stirring at least twice during the baking time. Pour/ladle/push/scrape into a large bowl and add about a cup of craisins or raisins or a mix of both. Have a taste while it’s still warm! That way you know what to look forward to for breakfast the next morning. What makes this recipe so easy and convenient? – For one, the wet ingredients don’t have to be cooked or heated, like in other recipes. Just mix well, then mix with dry ingredients. – It’s easy to remember the ingredients and even the amounts if you just make a bit of an effort. That way, you don’t have to keep looking for and at the recipe, which is what always slows me down while baking. This recipe is fast because I’ve known it by heart for more than a year. All the grains and nuts are 1 cup each, with coconut the only exception. Both sweeteners, maple syrup and brown sugar, are 1/4 cup plus 2 tablespoons – easy to remember, after a while anyway. – Since the prescribed oven temperature is low, the baking time is somewhat flexible, depending on how crunchy you want your granola (and depending on how often you’ll remember to check your oven). 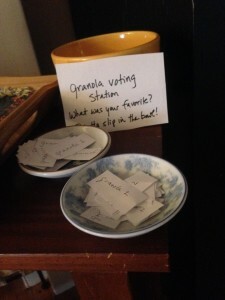 One time I dozed off for a nap and woke with a start – “The granola! !”- clearly expecting I’d have to make another batch that night. But no, there it was, just fine, if perhaps a bit crunchier and clumpier, but by no means burned. And no one complained the next morning. – You can add or substitute a whole bunch of things and still have it taste distinctively like Towne Motel granola. We’ve added some pumpkin or sunflower seeds, used dry apricots or pineapple in addition to raisins, made a lower calorie /lower fat version for our health-conscious head housekeeper, added extra toasted coconut one time because I thought I’d forgotten the coconut, which I hadn’t – and it was all still very good. – It keeps well, too, in a storage or freezer bag. You’ll notice the difference between freshly baked and one week old, but the one week old is still excellent. Even the two week old is good! I haven’t tried to freeze it yet, or substituted other nuts (I’d never leave out the cashews! And definitely not the coconut) – nor have I added chocolate chips or other more decadent ingredients. Maybe one day when we have a lot of kids, we could make half the bowl with some additional M&Ms, and see how that goes. Here’s our first recipe-share post. I think I promised to start doing these last month…and then high season began. Which means we’ve been really busy. And baking a lot! This recipe comes with a story. When we were inn-shopping with Rick and Janet Wolf of The B&B Team, they noted how important the “hand-off” process is: the transition between the sellers and buyers/new and old innkeepers. If you’re very lucky, you buy a successful property from wonderful innkeepers. We were very lucky. Rick and Jane Ellis were and are teachers, mentors, and true friends. We’re still e-mailing them questions–sometimes frantic ones. They always reply super-promptly, with lots of details and reassurances. As I wrote in our first post, it takes a village. We’re still learning. 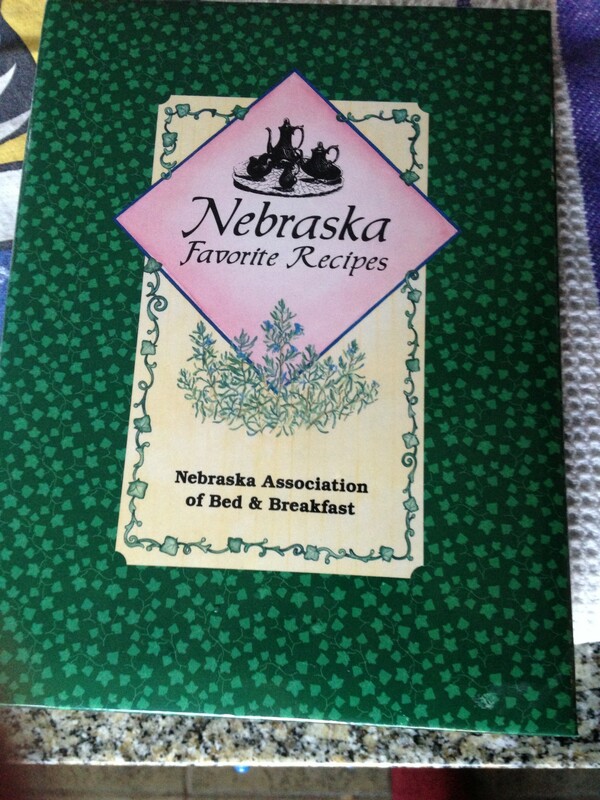 Jane generously left us with a folder of her “greatest breakfast hits” at Towne Motel, and every so often in our emails she would ask, “Have you tried (recipe X) yet? Remember the file is in the black hutch in the dining room.” And we would say oh yeah, Jane’s file! Then the phone would ring or some other (take your pick) distraction would ensue, and we’d flake off about the file once again. Then fate intervened. A family from Brooklyn who stayed at Towne Motel last summer returned last week and told us about Jane’s apricot squares. The kids were raving about them (and missing them) A YEAR LATER. This family was going out to Vinylhaven Island for a few days and staying with us again later in the week. So I emailed Jane for the recipe. She replied within hours: this was her most popular offering ever! Lots of requests for the recipe from guests. And guess what? The recipe was in the file, in the hutch. This time I actually went to the hutch and got it out. And boy are these great. The family from Brooklyn was SO happy to see them on the table that Thursday morning. I’d printed out the recipe for them (Jane had given them a copy last year but they’d misplaced it). 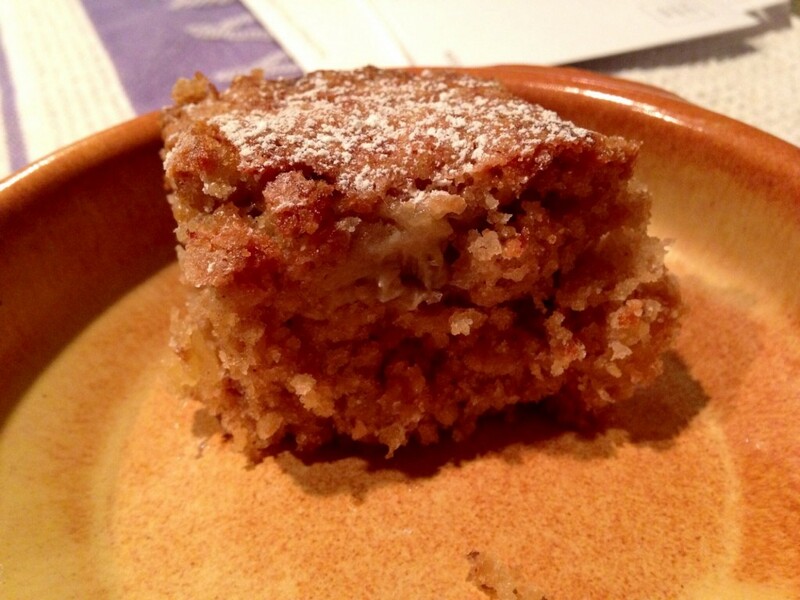 But before they came to breakfast, another guest was loving the squares and requested the recipe! I’ve gotten I think a total of 4 recipe requests in our almost 10 months here. Two of them were for these bars. And, major bonus: they are really simple to make. Some of the best things are. We are now happily working through that file. Stay tuned: we’ll be sharing more of these. Jane says this is a Giada DeLauritis recipe. But to us they will always be Jane’s bars. Spread about 1/2 of mixture into a 9/13 inch pan (coat with butter or butter/flour spray). Top with approx 15 oz. (not quite full jar) of apricot preserves. Cover filling with remainder of crust mixture and gently press to flatten. Bake at 350 until light golden, about 30-35 minutes. Cool for an hour, or overnight. Stores well for up to 3 days. Can use 1/2 recipe for an 8″ square pan. You can substitute apricot jam with other fillings, such as blueberry or cherry pie filling (homemade or in a can).